In his review of Peter Brook’s landmark multi-hour adaptation of The Mahabharata, American director/critic Charles Marowitz posited that if you want to avoid being criticized, create a work that exists beyond the rubric of criticism. This is the potential issue raised when one approaches the work of artists whose aesthetic challenges all of our preconceived notions about the theatrical experience. Welsh theatre maker Shon Dale-Jones‘ Floating presents such a case. Currently making its third Canadian stop after being hosted by Vancouver’s Arts Club Theatre during the PuSh Festival and Intrepid Theatre in Victoria, Floating is performed by Dale-Jones and his co-creator Sioned Rowlands and has been, as we are told, years in the making. Prompted by the death of his beloved grandmother — portrayed in one of three charming performances by the admittedly untrained Rowlands — Dale-Jones’ theatrical alter-ego Hugh Hughes uses a tall tale about a Welsh island which separates from the mainland as a means to muse on community, family, and socio-cultural displacement. As the audience enters, Rowlands is seated onstage, quietly knitting, amidst a random assortment of projectors, miss-matched furniture and hand made charts and graphs. This folk-art aesthetic could be called ‘anti-theatre’ and it might be familiar to Toronto audiences from some of the work of companies Small Wooden Shoe and One Reed Theatre. In this world, all of the pretenses of theatre are stripped away, the means of production are on display, and epic images are built from humble objects. Dale-Jones and Rowlands couldn’t be a more lovely pair and they wring a combination of pathos and bathos from Floating’s thin narrative frame which includes a crotchety school master’s scheme to sail an island, and a game of chicken with the Isle of White. 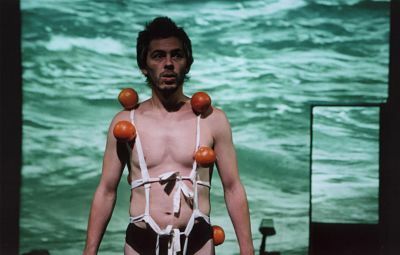 The chatty nature of the performance and the childlike simplicity of the imagery conspires to breakdown the typical disconnect between performer and spectator; a sense of community or, as Hughes constantly reminds the us, ‘connection’ is the goal. The open heartedness of the performance is made even more impressive by the ease with which charming can mutate into smarmy when forced; there is none of that here. For all of the high points of Floating’s breezy self-effacing charm, the problem of how to judge the images/choices/themes that don’t pay off remains. Kenneth Tynan, perhaps the twentieth century’s most astute theatre critic, turned to Schiller’s three point model for theatrical evaluation: what is the play trying to do, does it do it, and is it worth doing. If the goal is to create a sense of community by knocking down the fourth wall and breaking through audience expectations with tactics like passing props around the house as in an elementary school show-and-tell, appointing a front row patron as a kind of navigator, or encouraging patrons in the balcony to relocate to the main floor — leading to a hilarious interaction between the performers and three local indie theatre creators in attendance on opening night — then what is the value of picking apart the specific directorial choices? The third of Schiller’s three questions is easily answered in the affirmative but the second question, the question as to whether or not Floating fully satisfy its dramaturgical goals, is the more problematic of the triad. In the slightly longwinded though often hysterical introduction, Dale-Jones outlines the themes he will explore in the piece. While Floating does contain some insights into the psychology of the Thatcher-era, the alienation from ideas of home and nationhood and the importance of the family, and in spite of the fact that the staged-lecture format allows for some interesting facts, ultimately I feel the piece lacks a fully satisfying emotional, political, or intellectual payoff. In spite of this fairly major quibble, in a cynical cultural moment ruled by banal hipster ‘authenticity’ by way of the warped equation of irony with nihilism, Floating’s earnestness and winsome passion are a welcomed antidote. As Ovid says in The Ars amatoria: ‘If you want to be loved, be lovable’. Floating runs February 15-19, 2011 at Harbourfront Centre’s World Stage. Perhaps it was because I had come from teching a show at Rhubarb earlier that morning, but in midst of winter, I totally appreciated Floating's joyous levity and clever storytelling. I felt that Floating was not trying to be anti-theatre per se but be what it is: an interactive multi-media work that incorporate and plays with verfremdung/theatrical self-consciousness. If you will, Brechtian, object-based, clown-turn filled story-telling crossed with a fantasy about escape and exile. And who can resist the charm of a pair of seasoned clown? The character of Hughes is like the archetypical nutty professor and his sideick is the village idiot in some ways...something I (if only secretly) desire to connect to, both in myself and in others. I'll speak to the mention of the folk-art aesthetic as one of the accused. When the designation folk-art (or folk anything) is applied by the maker it's usually connected to a defensive or protective impulse. On the other hand, designating someone else's work as folk-art is usually part of a strategy for keeping it out of circulation, reducing it from proposal to decoration - in other words: a defensive or protective impulse on the part of the speaker. I can see how the style of Floating could appear as defensive posturing, as you say. But the lengths to which they go in pursuit of their goal of making a personal connection with people - up to virtually abandoning the 'content' on the night I saw it - belie this. In fact, they're pursuing something clear pretty vigorously. They're not protecting themselves or any authorial position and there's nothing in their style or aesthetic that is beyond the rubric of criticism. There is something in Floating that seems beyond criticism however, though not because of its beyond-ness but in fact because of its ubiquity - and it is their intent to generate, in the audience, a feeling of warm connection - but without offering any critical perspective and without asking why that feeling might be important, what its nature is, and who or what that feeling serves. Without these questions theatre paints a picture of a humanity so alienated that all it can do is huddle together for warmth. To me this is a desperately pessimistic picture and that's why I don't feel any affinity with this work. In response to Even W who said "their intent to generate, in the audience, a feeling of warm connection - but without offering any critical perspective and without asking why that feeling might be important, what its nature is, and who or what that feeling serves." I take it as a given that any theatre piece would want to generate a feeling or connection - warm or not - with their audience otherwise what are they doing there? No connection, no bums in seats. No bums in seats, no theatre. No theatre, hell. Intellectualizing Floating is all very good but it turns something charming and enjoyable into something intimidating. What's the purpose? You want to attract people to the theatre not scare them away. We need more Floating and less theorizing. Slow clap for you Mr. Mooney. Couldn't agree more. Less theorizing and more Floating. I completely disagree with Evan in his statement that the piece generated ubitquitous feelings with no intent. In fact I think the company has a very strong purpose and perspective on generating a sense of community within their walls. I ask you, Mr. Evan, why does Hugh have to tell you what that feeling serves? You seem to have opinions coming out your wazoo. I appreciate the subtleties of the piece and the fact that it allowed me space to form my own opinions and to generate my own perspectives on the nature of community. For me, the artists didn't need to stuff pretentious theatrical persepective down my throat in order to feel connected to the work. On a bit of a side tangent, I saw The Johnny Cash show last night at the Panasonic theatre. This is a show I admittedly would normally snuff my high-browed nose at for being a meaningless musical revuew. However, when I got there, the theatre was packed with fringe wearing, hollering Cash fans who loved every minute of it. A promininant Toronto theatre critique recently bashed the performance for its triviality but that didn't seem to deter audiences. If theatre is made for the artists it becomes masturbatory - if its for the people it seems to thrive. That's exactly what the Johnny Cash show achieved, a shared sense of memory and a feeling of community amongst the people. This was something intangible and invisible that a theatre critique, and perhaps even myself to some degree, didn't understand. I think the same goes for Floating because it is for the people. The people are sick and tired of all this theorizing and are looking for something more. Isn't that statement enough? Let’s take a moment of reflection on the concept of audience participation and ask the question….why? Over the course of the past 6 months we have seen in almost every presentation at the World Stage Festival a play with the notion of breaking the 4th wall in some fashion or another. In many cases it involved a knowing glance to the audience, a seductive stare, a rhetorical question. Many of these could be the Epic Mother Courage of endeavors for actors; to stare in to the great void and command the audience out of its complacent emotive slumber. But in some cases as with “Floating” which was presented at Harbourfront last week, the audience engagement became a central if sometimes distracting side journey that at one point during the performance I attended seemed almost to submit the focus of the show completely over to three tardy elderly ladies from Thornhill. This reminds me of the great quote by W. C. Fields “never work with animals or children”. Maybe, I might add, some cute septuagenarians; real life will always upstage an actor. This 4th wall stumble has been on my mind for several weeks now and over the weekend I had the opportunity to take a non statistically significant poll about it with a good friend of mine; a classically trained, ivy league educated actor who is a regular on a popular WB series but who has also appeared at several respectable New York theater institutions. The conversation went something like this, (me) “what do you think of breaking the 4th wall in theater?” (friend) “audience participation or a monologue?” (me) “audience participation like making the people do a wave or naked dancers in the audiences lap” (friend) “I hate it, why can’t we just hold the audience with a good scene?”. AHA! You’re right I thought! What is this ridiculous notion that you need to wake me up from my slumber with what is happening on stage? Have 21st Century actors become so needy that no longer is it enough that we pay our tithe at the door but now have some social responsibility to be engaged? Was the tithe not enough in our compact to this 2 hours traffic on the stage? Worse than this, how vain is the assumption that by cavorting through the aisles or demanding a verbal answer from the collective darkness (potentially now in house lights) that this would draw me in to your performance and not in fact achieve the opposite and serve to alienate my further? Or perhaps what stands to occur with those of more experience is only to tire more from seeing one more performer grasping for life pleading for attention by using an old technique of audience engagement. Dave St. Pierre’s, un peu de tendresse was most successful in a moment when, exhausted after the struggle to connect with the audience through screaming, sending the chorus out into the seats, crying and attempting to shock us with a seeming emotional indifference to her lover, the narrator gives up, releases the attention and releases the tension. Finally then while naked on the floor she surprisingly slides beautifully, gracefully across the stage: A perfect theatrical moment. All of this is an excellent lead in to next week’s performance of La Voix Humane. The beauty of this work in its written form is the entrapment of the character within the walls of their own making, the telephone, the conversation, the romance and the anxiety of the emotional breakup. It will be interesting to see if any of these walls are broken down. We should pay particular attention to what the director and designers place between us and the performer, between the audience and the master communicator on stage.